If You Can't Be There in Person . . .
With the joyous occasion of the Royal Wedding coming up at the end of the month, many people are looking for ways they can help to celebrate. 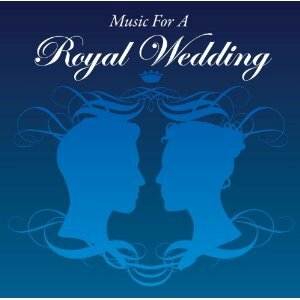 One way to help set the mood is by listening to the great new CD Music For A Royal Wedding. This CD contains 16 different selections, for a total running time of 67 minutes. Other songs will be familiar to listeners because they've been used in numerous televisions shows (The Flower Duet) or are old favorites (The Bridal March from Lohengrin, Pachelbel's Canon in D Major and God Save the Queen). If you are unlucky enough to have misplaced your invitation to the big event on April 29, you can still enjoy the atmosphere of being at a Royal Wedding by listening these uplifting and emotionally stirring songs!